China’s newest military transport aircraft, the Y-20, has officially joined the People’s Liberation Army Air Force on Wednesday. Designed and manufactured by state-owned aviation giant the Aviation Industry Corporation of China (AVIC), the Y-20 made its first flight in January 2013 and made its debut at the 10th China International Aviation and Aerospace Exhibition in November 2014. The newest Chinese heavy transporter has a length of 47 meters and a wingspan of 45 meters. With a maximum takeoff weight of 220 tons, the freighter can carry a payload of 66 tons. The vehicle can reach a maximum speed of 830 kilometers per hour. Officially codenamed “Kunpeng,” after a Chinese mythical bird that can fly for thousands of kilometers, the Y-20 has got the nickname “Chubby Girl” for its deep and wide fuselage. “To enhance national strength, China must build up its ability of indigenously designing and producing large aircraft and strengthen its air transport,” online news website Global Times reported Tang Changhong, chief designer for the Y-20, as saying. Last month, the first two Y-20 planes were delivered to the air force, after five years of design and manufacture as well as another four years of test flights. 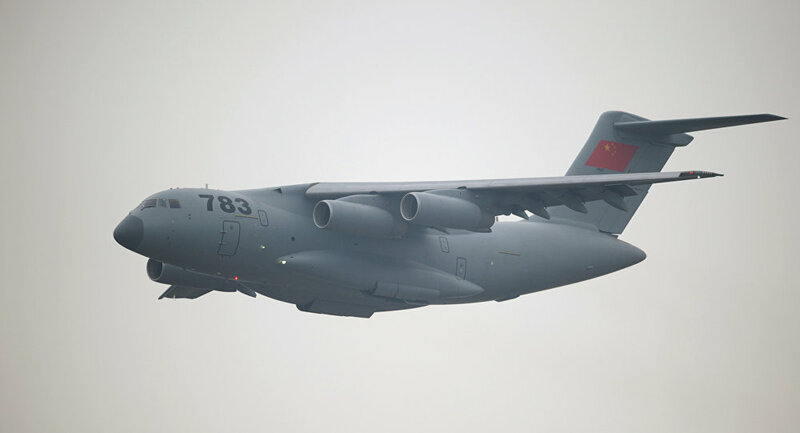 “The Y-20 entering into service marks a crucial step for the Air Force improving its strategic power projection capability,” Global Times reported Air Force spokesperson Shen Jinke as saying.